Covered multiple times in multiple versions elsewhere, but a recent chat with a classmate (who has to write about this topic in Chinese) made me consider attempting my own version. What are the common myths I have encountered about antibiotics and antibiotic resistance? Another version is that they work against colds and flu. Antibiotics are effective against bacteria and not viruses. They are not able to cure all bacterial infections – sometimes when the infections are too advanced or overwhelming, or if the person’s immune system is too compromised, giving the right antibiotics will not save that person’s life or limb. Taking an antibiotic for an infection is the metaphorical equivalent of using a series of atomic bombs to eradicate occupying troops in a conquered city. Huge numbers of “bystander” bacteria (we are colonised by just about as many bacteria/microbes as there are human cells in a body) are wiped out as part of the collateral damage – far more than the bacteria causing the infection. This collateral damage potentates some of the adverse effects that occur from taking antibiotics, which brings us to the next myth. This is neither technically wrong, nor a myth. Most antibiotics are indeed very safe especially if one compares them to drugs such as the older forms of cancer chemotherapy. But many patients and some doctors equate this to having no adverse effects from taking antibiotics. And the risk of adverse effects are probably assigned too little weight when the consideration for antibiotic prescription is being made. A common problem of reference. Humans (and animals) do not become resistant to antibiotics, it is the bacteria that do so. A comfortable concept but unfortunately, completely untrue. Any use of antibiotics generates a selection pressure on the microbiome and environment, resulting eventually in the development and spread of antibiotic resistance. Reducing the use of antibiotics (logically – reducing inappropriate use) will reduce the selection pressure and therefore at best slow down the development and spread of antibiotic resistance. This was consistently included as a “common antibiotic myth” up until the end of 2015, including in periodicals such as Time Magazine. 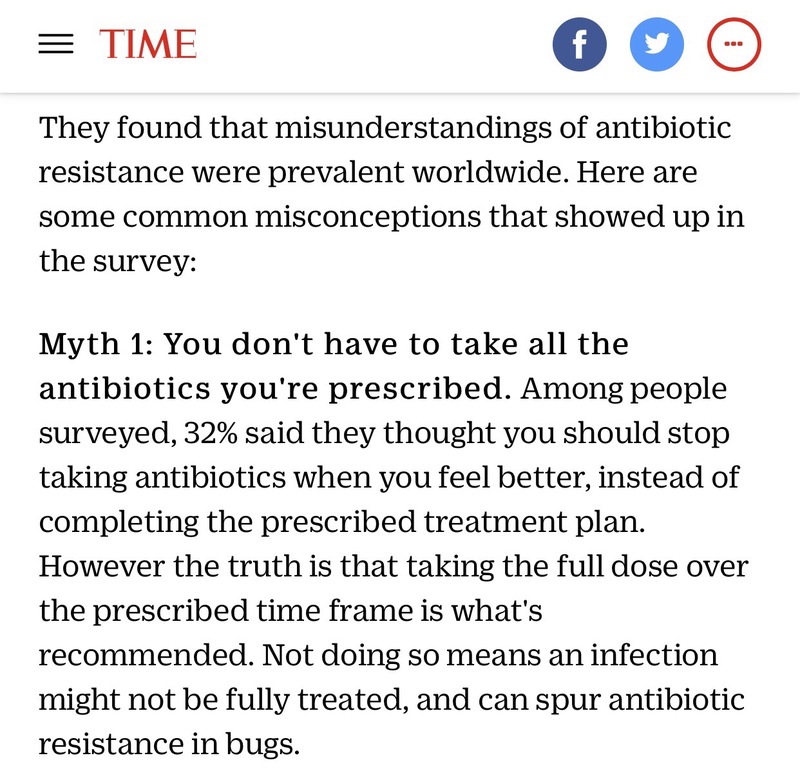 Screen capture from the Time magazine website – 2015 article on antibiotic myths. But there is now greater understanding that the “corrective advice” – to complete a course of antibiotics no matter the underlying illness – is not always right (or even commonly right), and this orthodoxy is coming under greater challenge, even at the level of the World Health Organization. The issue here has to do with the messaging. For a small number of infectious conditions, stopping antibiotics once one starts to feel better results in real risks of infection relapse and bad outcomes (think infective endocarditis, tuberculosis, and more broadly, HIV and malaria). A broad message such as “stopping antibiotics once one feels better” might be misinterpreted and extended to those conditions where one should finish every single pill/dose of antibiotic. Which message would result in more harm? Or how should one couch the public messaging? That is the key educational conundrum here. A surprisingly common myth among doctors and even infectious disease physicians. This is also not supported by the available clinical evidence except for a very narrow range of severe bacterial infections – Prof Brad Spellberg addressed this myth as well in his very erudite article on antibiotic myths in Medscape.